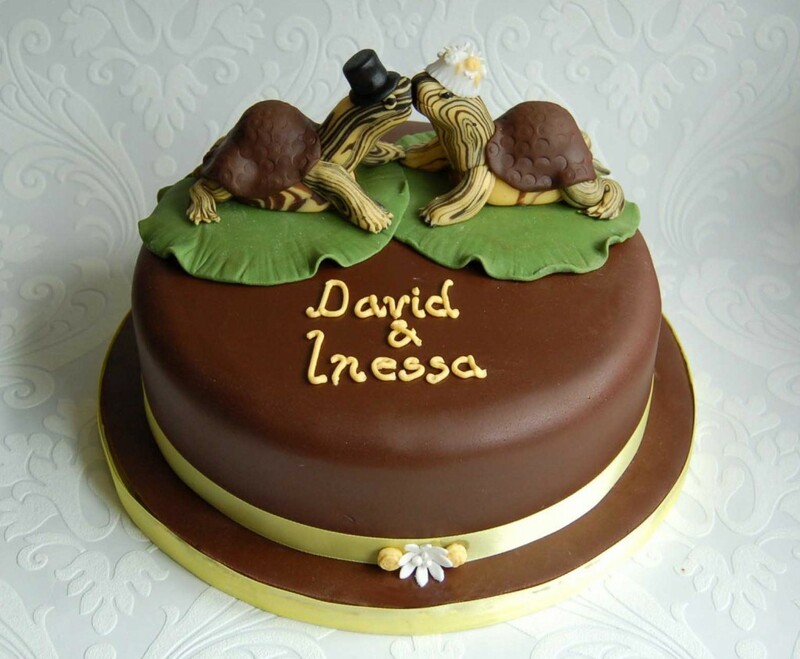 Really – why do we think that chocolate should be relegated to the groom’s cake? Let’s be honest. The brides do all the work. 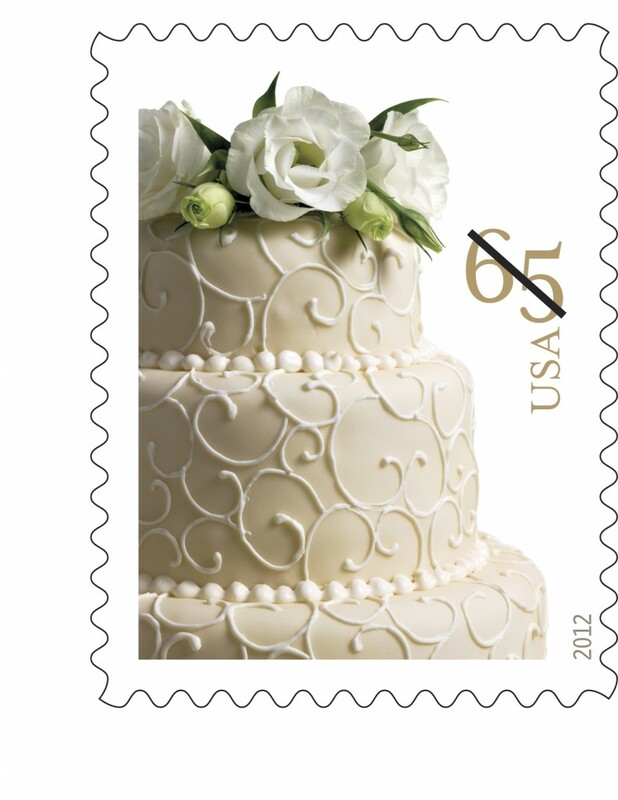 The brides starve and sweat their brains out in exercise classes to fit into that dress, and it’s the brides who avoid all those “illegal” foods leading up to the wedding so that they are their blushing, rosy perfect selves. 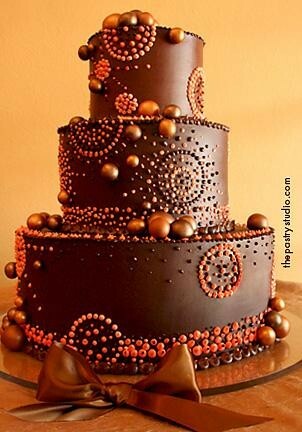 So seriously…WHO deserves chocolate at that wedding reception MORE THAN THE BRIDE? What finds you this January day? I’m in a cold, albeit sunny, locale, wondering if I’m ever going to get around to making New Year’s Resolutions, while the rest of the world is busy breaking them. What about you? How are yours going? My best friend Robin and her husband dated for 10 years before they got married. The Best Man, the Maid of Honor, and the Father of the Bride speeches all had the same theme. 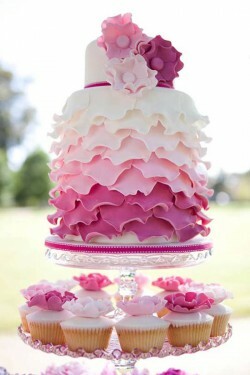 Today, we wrap up Ruffle Week 2011 here on A Wedding Cake Blog with a cake that has a little different take on the frilly furbelows of ruffles. 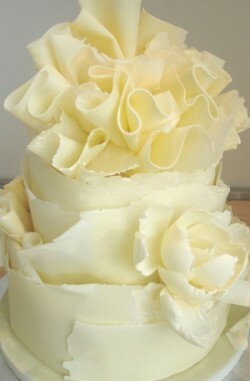 Ruffles. Meet Chocolate. Helloooo, perfection. Isn’t this pretty? So nice and…autumn-y. I think Christen will be really impressed with me for posting this one. What do y’all think? 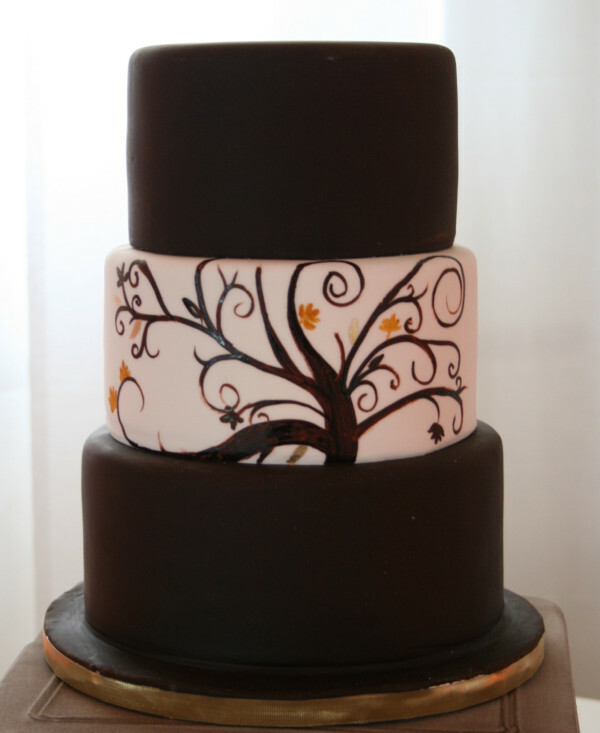 This beautiful cake, made by Slice Cake Studio in Longmont, CO, was inspired by the couple’s wedding invitation! 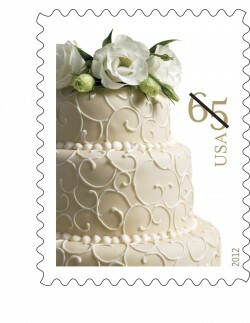 I would really like to see that stationary personally, because this is stunning and I think it just looks, well…yummy. I hope that your Halloween candy induced sugar high did not end up here last night. And by here I mean the slammer…because that’s what is featured on this grooms cake. 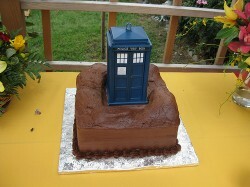 Or, well I guess technically it’s a Police Box? I had no idea what that is. So I had to get my research on. True story. When I took my first trip to Europe I was 15 and my friend Brett begged me to bring him back some Smarties. At first I scoffed at his request. He could go down to the store and buy his own Smarties. It wasn’t until later that he explained that Smarties and Smarties were different. American Smarties are those round little things made from nothing but pure sugar. European Smarties are actually flat round chocolates in a candy coated shell. Think M&M’s but double the size. I ate nothing but Smarties the entire two weeks I was in Europe..and maybe some pasta in Italy. I think all I remember is the Smarties. I was 15 I knew nothing of the joys of pasta covered in cheese and butter. I could also spend two weeks eating nothing but Smarties and it wouldn’t show up on my thighs a week later. Imagine my happiness when I found this cake covered entirely in Smarties. It’s almost channeling the Sixlet covered cake that I featured a few weeks ago. Perhaps it’s my love of candy covered cake or nostalgia for my youth that has my heart thumping when I first laid eyes on this beauty. What do you think? Do you love cake covered in candy? 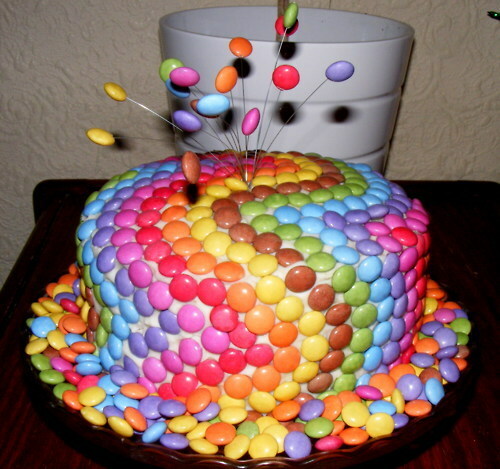 Have you ever had Smarties? Did it change your life? Do you still wish you had the metabolism of a 15 year old? I saw this on Pinterest a few months ago and I pinned it but never thought of it again. 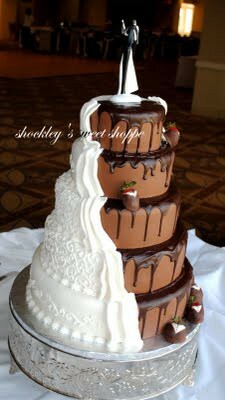 In fact I had convinced myself that I already blogged about this just cake and just spent about 15 minutes looking through the archives just to check. I didn’t and I kind of shocked myself. 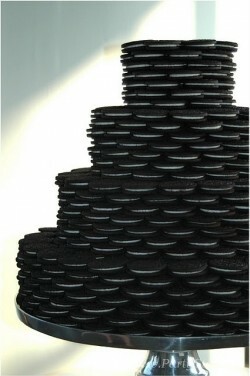 An Oreo cake. Seriously…where is the milk? Because I am ready to twist and dunk thank you very much.